As I was writing this, it was very early (I had to wake up at 04:30) and I was groggy, because we were on an urgent road trip to Pennsylvania for the funeral of my aunt who died quite suddenly a few days ago. I have since edited this post more thoroughly to minimize the impact of my sleep deprivation upon its content. Actually maybe this is a good thing; the saying goes, “write drunk, edit sober” and sleep deprivation and alcohol have remarkably similar symptoms, probably because alcohol is GABA-ergic and GABA is involved in sleep regulation. Awhile ago I wrote a long post on tax incidence, but the primary response I got was basically the online equivalent of a perplexed blank stare. Struck once again by the Curse of Knowledge, I underestimated the amount of background knowledge necessary to understand my explanation. 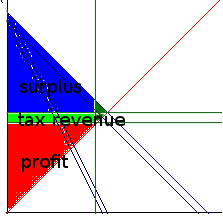 But tax incidence is very important for public policy, so I really would like to explain it. Therefore I am now starting again, slower, in smaller pieces. Today’s piece is about the downsides of taxation in general, why we don’t just raise taxes as high as we feel like and make the government roll in dough. To some extent this is obvious; if income tax were 100%, why would anyone bother working for a salary? You might still work for fulfillment, or out of a sense of duty, or simply because you enjoy what you do—after all, most artists and musicians are hardly in it for the money. But many jobs are miserable and not particularly fulfilling, yet still need to get done. How many janitors or bus drivers work purely for the sense of fulfillment it gives them? Mostly they do it to pay the bills—and if income tax were 100%, it wouldn’t anymore. The formal economy would basically collapse, and then nobody would end up actually paying that 100% tax—so the government would actually get very little revenue, if any. At the other end of the scale, it’s kind of obvious that if your taxes are all 0% you don’t get any revenue. This is actually more feasible than it may sound; provided you spend only a very small amount (say, 4% of GDP, though that’s less than any country actually spends—maybe you could do 6% like Bangladesh) and you can still get people to accept your currency, you could, in principle, have a government that funds its spending entirely by means of printing money, and could do this indefinitely. In practice, that has never been done, and the really challenging part is getting people to accept your money if you don’t collect taxes in it. One of the more counter-intuitive aspects of modern monetary theory (or perhaps I should capitalize it, Modern Monetary Theory, though the part I agree with is not that different from standard Keynesian theory) is that taxation is the primary mechanism by which money acquires its value. And then of course with intermediate tax rates such as 20%, 30%, and 50% that actual countries actually use, we do get some positive amount of revenue. Everything I’ve said so far may seem pretty obvious. Yeah, usually taxes raise revenue, but if you taxed at 0% or 100% they wouldn’t; so what? Well, this leads to quite an important result. 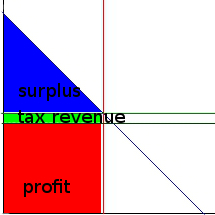 Assuming that tax revenue is continuous (which isn’t quite true, but since we can collect taxes in fractions of a percent and pay in pennies, it’s pretty close), it follows directly from the Extreme Value Theorem that there is in fact a revenue-maximizing tax rate. Both below and above that tax rate, the government takes in less total money. These theorems don’t tell us what the revenue-maximizing rate is; but they tell us that it must exist, somewhere between 0% and 100%. Indeed, it follows that there is what we call the Laffer Curve, a graph of tax revenue as a function of tax rate, and it is in fact a curve, as opposed to the straight line it would be if taxes had no effect on the rest of the economy. Now, the Laffer curve has been abused many times; in particular, it’s been used to feed into the “trickle-down” “supply-side” Reaganomics that has been rightly derided as “voodoo economics” by serious economists. Jeb Bush (or should I say, Jeb!) and Marco Rubio would have you believe that we are on the right edge of the Laffer curve, and we could actually increase tax revenue by cutting taxes, particularly on capital gains and incomes at the top 1%; that’s obviously false. We tried that, it didn’t work. Even theoretically we probably should have known that it wouldn’t; but now that we’ve actually done the experiment and it failed, there should be no serious doubt anymore. No, we are on the left side of the Laffer curve, where increasing taxes increases revenue, much as you’d intuitively expect. It doesn’t quite increase one-to-one, because adding more taxes does make the economy less efficient; but from where we currently stand, a 1% increase in taxes leads to about a 0.9% increase in revenue (actually estimated as between 0.78% and 0.99%). 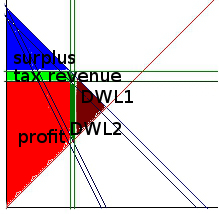 Denmark may be on the right side of the Laffer curve, where they could raise more revenue by decreasing tax rates (even then I’m not so sure). But Denmark’s tax rates are considerably higher than ours; while in the US we pay about 27% of GDP in taxes, folks in Denmark pay 49% of GDP in taxes. The fact remains, however, that there is a Laffer curve, and no serious economist would dispute this. Increasing taxes does in fact create distortions in the economy, and as a result raising tax rates does not increase revenue in a one-to-one fashion. When calculating the revenue from a new tax, you must include not only the fact that the government will get an increased portion, but also that the total amount of income will probably decrease. Now, I must say probably, because it does depend on what exactly you are taxing. If you tax something that is perfectly inelastic—the same amount of it is going to be made and sold no matter what—then total income will remain exactly the same after the tax. It may be distributed differently, but the total won’t change. This is one of the central justifications for a land tax; land is almost perfectly inelastic, so taxing it allows us to raise revenue without reducing total income. In fact, there are certain kinds of taxes which increase total income, which makes them basically no-brainer taxes that should always be implemented if at all feasible. 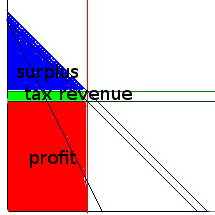 These are Pigovian taxes, which are taxes on products with negative externalities; when a product causes harm to other people (the usual example is pollution of air and water), taxing that product equal to the harm caused provides a source of government revenue that also increases the efficiency of the economy as a whole. If we had a tax on carbon emissions that was used to fund research into sustainable energy, this would raise our total GDP in the long run. Taxes on oil and natural gas are not “job killing”; they are job creating. This is why we need a carbon tax, a higher gasoline tax, and a financial transaction tax (to reduce harmful speculation); it’s also why we already have high taxes on alcohol and tobacco. The alcohol tax is one of the great success stories of Pigouvian taxation.The alcohol tax is actually one of the central factors holding our crime rate so low right now. Another big factor is overall economic growth and anti-poverty programs. The most important factor, however, is lead, or rather the lack thereof; environmental regulations reducing pollutants like lead and mercury from the environment are the leading factor in reducing crime rates over the last generation. Yes, that’s right—our fall in crime had little to do with state police, the FBI, the DEA, or the ATF; our most effective crime-fighting agency is the EPA. This is really not that surprising, as a cognitive economist. Most crime is impulsive and irrational, or else born of economic desperation. Rational crime that it would make sense to punish harshly as a deterrent is quite rare (well, except for white-collar crime, which of course we don’t punish harshly enough—I know I harp on this a lot, but HSBC laundered money for terrorists). Maybe crime would be more common if we had no justice system in place at all, but making our current system even harsher accomplishes basically nothing. Far better to tax the alcohol that leads good people to bad decisions. It also matters whom you tax, though one of my goals in this tax incidence series is to explain why that doesn’t mean quite what most people think it does. The person who writes the check to the government is not necessarily the person who really pays the tax. The person who really pays is the one whose net income ends up lower after the tax is implemented. Often these are the same person; but often they aren’t, for fundamental reasons I’m hoping to explain. For now, it’s worth pointing out that a tax which primarily hits the top 1% is going to have a very different impact on the economy than one which hits the entire population. Because of the income and substitution effects, poor people tend to work less as their taxes go up, but rich people tend to work more. Even within income brackets, a tax that hits doctors and engineers is going to have a different effect than a tax that hits bankers and stock traders, and a tax that hits teachers is going to have a different effect than a tax that hits truck drivers. A tax on particular products or services will reduce demand for those products or services, which is good if that’s what you’re trying to do (such as alcohol) but not so good if it isn’t. So, yes, there are cases where raising taxes can actually increase, or at least not reduce, total income. These are the exception, however; as a general rule, in a Pirate Code sort of way, taxes reduce total income. It’s not simply that income goes down for everyone but the government (which would again be sort of obvious); income goes down for everyone including the government. The difference is simply lost, wasted away by a loss in economic efficiency. We call that difference deadweight loss, and for a poorly-designed tax it can actually far exceed the revenue received. I think an extreme example may help to grasp the intuition: Suppose we started taxing cars at 200,000%, so that a typical new car costs something like $40 million with taxes. (That’s not a Lamborghini, mind you; that’s a Honda Accord.) What would happen? Nobody is going to buy cars anymore. Overnight, you’ve collapsed the entire auto industry. Dozens of companies go bankrupt, thousands of employees get laid off, the economy immediately falls into recession. And after all that, your car tax will raise no revenue at all, because not a single car will sell. It’s just pure deadweight loss. That’s an intentionally extreme example; most real-world taxes in fact create less deadweight loss than they raise in revenue. But most real-world taxes do in fact create deadweight loss, and that’s a good reason to be concerned about any new tax. 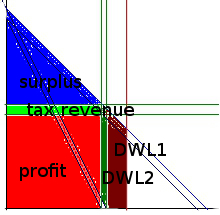 In general, higher taxes create lower total income, or equivalently higher deadweight loss. All other things equal, lower taxes are therefore better. What most Americans don’t seem to quite grasp is that all other things are not equal. That tax revenue is central to the proper functioning of our government and our monetary system. We need a certain amount of taxes in order to ensure that we can maintain a stable currency and still pay for things like Medicare, Social Security, and the Department of Defense (to name our top three budget items). Alternatively, we could not spend so much on those things, and that is a legitimate question of public policy. I personally think that Medicare and Social Security are very good things (and I do have data to back that up—Medicare saves thousands of lives), but they aren’t strictly necessary for basic government functioning; we could get rid of them, it’s just that it would be a bad idea. As for the defense budget, some kind of defense budget is necessary for national security, but I don’t think I’m going out on a very big limb here when I say that one country making 40% of all world military spending probably isn’t. We can’t have it both ways; if you want Medicare, Social Security, and the Department of Defense, you need to have taxes. “Cutting spending” always means cutting spending on something—so what is it you want to cut? A lot of people seem to think that we waste a huge amount of money on pointless bureaucracy, pork-barrel spending, or foreign aid; but that’s simply not true. All government administration is less than 1% of the budget, and most of it is necessary; earmarks are also less than 1%; foreign aid is also less than 1%. Since our deficit is about 15% of spending, we could eliminate all of those things and we’d barely put a dent in it. There are in fact sound economic reasons to keep taxes low. 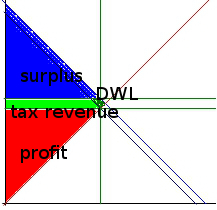 The Laffer Curve is absolutely a real thing, even though most of its applications are wrong. But sometimes we need taxes to be higher, and that’s a tradeoff we have to make.We need to have a serious public policy discussion about where our priorities lie, not keep trading sound-bytes about “cutting wasteful spending” and “job-killing tax hikes”. So really tax incidence is in my top five things you should know about economics, and yet I still haven’t talked about it very much. Well, today I will. The basic principles of supply and demand I’m basically assuming you know, but I really should spend some more time on monopoly and externalities at some point. Why is tax incidence so important? Because of one central fact: The person who pays the tax is not the person who writes the check. It doesn’t matter whether a tax is paid by the buyer or the seller; it matters what the buyer and seller can do to avoid the tax. If you can change your behavior in order to avoid paying the tax—buy less stuff, or buy somewhere else, or deduct something—you will not bear the tax as much as someone else who can’t do anything to avoid the tax, even if you are the one who writes the check. If you can avoid it and they can’t, other parties in the transaction will adjust their prices in order to eat the tax on your behalf. In the limit in which supply and demand are both completely fixed (perfectly inelastic), you can tax however you want and it’s just free redistribution of wealth however you like. In the limit in which supply and demand are both locked into a single price (perfectly elastic), you literally cannot tax that good—you’ll just eliminate production entirely. There aren’t a lot of perfectly elastic goods in the real world, but the closest I can think of is cash. If you instituted a 2% tax on all cash withdrawn, most people would stop using cash basically overnight. If you want a simple way to make all transactions digital, find a way to enforce a cash tax. When you have a perfect substitute available, taxation eliminates production entirely. To really make sense out of tax incidence, I’m going to need a lot of a neoclassical economists’ favorite thing: Supply and demand curves. These things pop up everywhere in economics; and they’re quite useful. I’m not so sure about their application to things like aggregate demand and the business cycle, for example, but today I’m going to use them for the sort of microeconomic small-market stuff that they were originally designed for; and what I say here is going to be basically completely orthodox, right out of what you’d find in an ECON 301 textbook. Let’s assume that things are linear, just to make the math easier. You’d get basically the same answers with nonlinear demand and supply functions, but it would be a lot more work. Likewise, I’m going to assume a unit tax on goods—like $2890 per hectare—as opposed to a proportional tax on sales—like 6% property tax—again, for mathematical simplicity. The next concept I’m going to have to talk about is elasticity—which is the proportional amount that quantity sold changes relative to price. If price increases 2% and you buy 4% less, you have a demand elasticity of -2. If price increases 2% and you buy 1% less, you have a demand elasticity of -1/2. If price increases 3% and you sell 6% more, you have a supply elasticity of 2. If price decreases 5% and you sell 1% less, you have a supply elasticity of 1/5. Elasticity doesn’t have any units of measurement, it’s just a number—which is part of why we like to use it. It also has some very nice mathematical properties involving logarithms, but we won’t be needing those today. 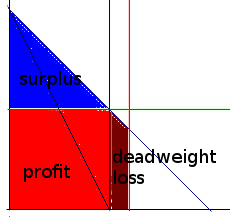 The price that renters are willing and able to pay, the demand price PD will start at their maximum price, the reserve price PR, and then it will decrease linearly according to the quantity of land rented Q, according to a linear function (simply because we assumed that) which will vary according to a parameter e that represents the elasticity of demand (it isn’t strictly equal to it, but it’s sort of a linearization). We’re interested in what is called the consumer surplus; it is equal to the total amount of value that buyers get from their purchases, converted into dollars, minus the amount they had to pay for those purchases. This we add to the producer surplus, which is the amount paid for those purchases minus the cost of producing them—which is basically just the same thing as profit. Togerther the consumer surplus and producer surplus make the total economic surplus, which economists generally try to maximize. Because different people have different marginal utility of wealth, this is actually a really terrible idea for deep and fundamental reasons—taking a house from Mitt Romney and giving it to a homeless person would most definitely reduce economic surplus, even though it would obviously make the world a better place. Indeed, I think that many of the problems in the world, particularly those related to inequality, can be traced to the fact that markets maximize economic surplus rather than actual utility. 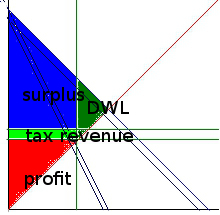 But for now I’m going to ignore all that, and pretend that maximizing economic surplus is what we want to do. You can read off the economic surplus straight from the supply and demand curves; it’s the area between the lines. (Mathematically, it’s an integral; but that’s equivalent to the area under a curve, and with straight lines they’re just triangles.) 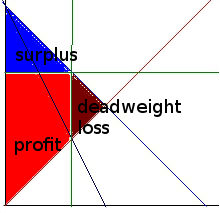 I’m going to call the consumer surplus just “surplus”, and producer surplus I’ll call “profit”. I’m going to be bold here and actually use equations! Hopefully this won’t turn off too many readers. I will give each equation in both a simple text format and in proper LaTeX. Remember, you can render LaTeX here. The marginal cost that landlords have to pay, the supply price PS, is a bit weirder, as I’ll talk about more in a moment. For now let’s say that it is a linear function, starting at zero cost for some quantity Q0 and then increases linearly according to a parameter n that similarly represents the elasticity of supply. Now, if you introduce a tax, there will be a difference between the price that renters pay and the price that landlords receive—namely, the tax, which we’ll call T. I’m going to assume that, on paper, the landlord pays the whole tax. As I said above, this literally does not matter. I could assume that on paper the renter pays the whole tax, and the real effect on the distribution of wealth would be identical. 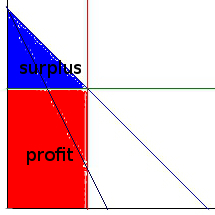 All we’d have to do is set PD = P and PS = P – T; the consumer and producer surplus would end up exactly the same. Or we could do something in between, with P’D = P + rT and P’S = P – (1 – r) T.
Notice the equivalency here; if we set P’D = P + rT and P’S = P – (1 – r) T, so that the consumer now pays a fraction of the tax r.
That’s if the market is competitive. If the market is a monopoly, instead of setting the prices equal, we set the price the landlord receives equal to the marginal revenue—which takes into account the fact that increasing the amount they sell forces them to reduce the price they charge everyone else. Thus, the marginal revenue drops faster than the price as the quantity sold increases. Yes, it changes some 1s into 2s. That by itself accounts for the full effect of monopoly. That’s why I think it’s worthwhile to use the equations; they are deeply elegant and express in a compact form all of the different cases. They look really intimidating right now, but for most of the cases we’ll consider these general equations simplify quite dramatically. There are several cases to consider. This is like setting n = 0 and T = 0 in the above equations, the competitive ones. If we now introduce a tax, it will fall completely on the landlords, because they have little choice but to rent out all the land they have, and they can only rent it at a price—including tax—that the market will bear. Now we still have n = 0 but not T = 0. Notice how T isn’t in the result. The consumer surplus is unaffected by the tax. T appears linearly as TQ0, which is the same as the tax revenue. All the money goes directly from the landlord to the government, as we want if our goal is to redistribute wealth without raising rent. But now suppose that the market is not competitive, and by tacit collusion or regulatory capture the landlords can exert some market power; this is quite likely the case in reality. Actually in reality we’re probably somewhere in between monopoly and competition, either oligopoly or monopolistic competition—which I will talk about a good deal more in a later post, I promise. It could be that demand is still sufficiently high that even with their market power, landlords have an incentive to rent out all their available land, in which case the result will be the same as in the competitive market. Indeed, in this case it doesn’t really matter that the market is monopolistic; everything is the same as it would be under a competitive market. Notice how if you set n = 0, the monopolistic equations and the competitive equations come out exactly the same. The good news is, this is quite likely our actual situation! So even in the presence of significant market power the land tax can redistribute wealth in just the way we want. This will create some of what we call deadweight loss, in which some economic value is wasted. By restricting the land they rent out, the landlords make more profit, but the harm they cause to tenant is created than the profit they gain, so there is value wasted. Now instead of setting n = 0, we actually set n = infinity. Why? Because the reason that the landlords restrict the land they sell is that their marginal revenue is actually negative beyond that point—they would actually get less money in total if they sold more land. Instead of being bounded by their cost of production (because they have none, the land is there whether they sell it or not), they are bounded by zero. (Once again we’ve hit upon a fundamental concept in economics, particularly macroeconomics, that I don’t have time to talk about today: the zero lower bound.) Thus, they can change quantity all they want (within a certain range) without changing the price, which is equivalent to a supply elasticity of infinity. The quantity Q0 completely drops out, because it doesn’t matter how much land is available (as long as it’s enough); it only matters how much land it is profitable to rent out. This time, the tax does have an effect on reducing the consumer surplus. Notice how it is also reduced by the tax—and no longer in a simple linear way. The sum is actually reduced by an amount equal to e/2*T^2, which is the deadweight loss. Notice, however, that because the supply of land is inelastic the deadweight loss is still relatively small compared to the huge amount of tax revenue. But actually this isn’t the whole story, because a land tax provides an incentive to get rid of land that you’re not profiting from. If this incentive is strong enough, the monopolistic power of landlords will disappear, as the unused land gets sold to more landholders or to the government. This is a way of avoiding the tax, but it’s one that actually benefits society, so we don’t mind incentivizing it. Now, let’s compare this to our current system of property taxes, which include the value of buildings. Buildings are expensive to create, but we build them all the time; the supply of buildings is strongly dependent upon the price at which those buildings will sell. This makes for a supply curve that is somewhat elastic. Since both n and e are finite and nonzero, we’d need to use the whole equations: Since the algebra is such a mess, I don’t see any reason to subject you to it; but suffice it to say, the T does not drop out. Tenants do see their consumer surplus reduced, and the larger the tax the more this is so. Once again, we’d need the full equations, and once again it’s a mess; but the result is, as before, that the tax gets passed on to the tenants in the form of more restricted sales and therefore higher rents. Because of the finite supply elasticity, there’s no way that the tax can avoid raising the rent. As long as landlords have to pay more taxes when they build more or better buildings, they are going to raise the rent in those buildings accordingly—whether the market is competitive or not. But if we set the rent control too low, or don’t properly account for the varying cost of different buildings, we can instead introduce a new kind of deadweight loss, by making it too expensive to make new buildings. In fact, what actually seems to happen is more complicated than that—because otherwise the number of buildings is obviously far too small, rent control is usually set to affect some buildings and not others. So what seems to happen is that the rent market fragments into two markets: One, which is too small, but very good for those few who get the chance to use it; and the other, which is unaffected by the rent control but is more monopolistic and therefore raises prices even further. This is why almost all economists are opposed to rent control (PDF); it doesn’t solve the problem of high rent and simply causes a whole new set of problems. A land tax with a basic income, on the other hand, would help poor people at least as much as rent control presently does—probably a good deal more—without discouraging the production and maintenance of new apartment buildings. But now we come to a key point: The land tax must be uniform per hectare. If it is instead based on the value of the land, then this acts like a finite elasticity of supply; it provides an incentive to reduce the value of your own land in order to avoid the tax. As I showed above, this is particularly pernicious if the market is monopolistic, but even if it is competitive the effect is still there. One exception I can see is if there are different tiers based on broad classes of land that it’s difficult to switch between, such as “land in Manhattan” versus “land in Brooklyn” or “desert land” versus “forest land”. But even this policy would have to be done very carefully, because any opportunity to substitute can create an opportunity to pass on the tax to someone else—for instance if land taxes are lower in Brooklyn developers are going to move to Brooklyn. Maybe we want that, in which case that is a good policy; but we should be aware of these sorts of additional consequences. The simplest way to avoid all these problems is to simply make the land tax uniform. And given the quantities we’re talking about—less than $3000 per hectare per year—it should be affordable for anyone except the very large landholders we’re trying to distribute wealth from in the first place. The good news is, most economists would probably be on board with this proposal. After all, the neoclassical models themselves say it would be more efficient than our current system of rent control and property taxes—and the idea is at least as old as Adam Smith. Perhaps we can finally change the fact that the rent is too damn high. Humans are nothing if not social animals. We like to follow the crowd, do what everyone else is doing—and many of us will continue to do so even if our own behavior doesn’t make sense to us. There is a very famous experiment in cognitive science that demonstrates this vividly. People are given a very simple task to perform several times: We show you line X and lines A, B, and C. Now tell us which of A, B or C is the same length as X. Couldn’t be easier, right? But there’s a trick: seven other people are in the same room performing the same experiment, and they all say that B is the same length as X, even though you can clearly see that A is the correct answer. Do you stick with what you know, or say what everyone else is saying? Typically, you say what everyone else is saying. Over 18 trials, 75% of people followed the crowd at least once, and some people followed the crowd every single time. Some people even began to doubt their own perception, wondering if B really was the right answer—there are four lights, anyone? Given that our behavior can be distorted by others in such simple and obvious tasks, it should be no surprise that it can be distorted even more in complex and ambiguous tasks—like those involved in finance. If everyone is buying up Beanie Babies or Tweeter stock, maybe you should too, right? Can all those people be wrong? In fact, matters are even worse with the stock market, because it is in a sense rational to buy into a bubble if you know that other people will as well. As long as you aren’t the last to buy in, you can make a lot of money that way. In speculation, you try to predict the way that other people will cause prices to move and base your decisions around that—but then everyone else is doing the same thing. By Keynes called it a “beauty contest”; apparently in his day it was common to have contests for picking the most beautiful photo—but how is beauty assessed? By how many people pick it! So you actually don’t want to choose the one you think is most beautiful, you want to choose the one you think most people will think is the most beautiful—or the one you think most people will think most people will think…. Our herd behavior probably made a lot more sense when we evolved it millennia ago; when most of your threats are external and human beings don’t have that much influence over our environment, the majority opinion is quite likely to be right, and can often given you an answer much faster than you could figure it out on your own. (If everyone else thinks a lion is hiding in the bushes, there’s probably a lion hiding in the bushes—and if there is, the last thing you want is to be the only one who didn’t run.) The problem arises when this tendency to follow the ground feeds back on itself, and our behavior becomes driven not by the external reality but by an attempt to predict each other’s predictions of each other’s predictions. Yet this is exactly how financial markets are structured. With this in mind, the surprise is not why markets are unstable—the surprise is why markets are ever stable. I think the main reason markets ever manage price stability is actually something most economists think of as a failure of markets: Price rigidity and so-called “menu costs“. If it’s costly to change your price, you won’t be constantly trying to adjust it to the mood of the hour—or the minute, or the microsecond—but instead trying to tie it to the fundamental value of what you’re selling so that the price will continue to be close for a long time ahead. You may get shortages in times of high demand and gluts in times of low demand, but as long as those two things roughly balance out you’ll leave the price where it is. But if you can instantly and costlessly change the price however you want, you can raise it when people seem particularly interested in buying and lower it when they don’t, and then people can start trying to buy when your price is low and sell when it is high. If people were completely rational and had perfect information, this arbitrage would stabilize prices—but since they’re not, arbitrage attempts can over- or under-compensate, and thus result in cyclical or even chaotic changes in prices. Our herd behavior then makes this worse, as more people buying leads to, well, more people buying, and more people selling leads to more people selling. If there were no other causes of behavior, the result would be prices that explode outward exponentially; but even with other forces trying to counteract them, prices can move suddenly and unpredictably. If most traders are irrational or under-informed while a handful are rational and well-informed, the latter can exploit the former for enormous amounts of money; this fact is often used to argue that irrational or under-informed traders will simply drop out, but it should only take you a few moments of thought to see why that isn’t necessarily true. The incentives isn’t just to be well-informed but also to keep others from being well-informed. If everyone were rational and had perfect information, stock trading would be the most boring job in the world, because the prices would never change except perhaps to grow with the growth rate of the overall economy. Wall Street therefore has every incentive in the world not to let that happen. And now perhaps you can see why they are so opposed to regulations that would require them to improve transparency or slow down market changes. Without the ability to deceive people about the real value of assets or trigger irrational bouts of mass buying or selling, Wall Street would make little or no money at all. Not only are markets inherently unstable by themselves, in addition we have extremely powerful individuals and institutions who are driven to ensure that this instability is never corrected. This is why as our markets have become ever more streamlined and interconnected, instead of becoming more efficient as expected, they have actually become more unstable. They were never stable—and the gold standard made that instability worse—but despite monetary policy that has provided us with very stable inflation in the prices of real goods, the prices of assets such as stocks and real estate have continued to fluctuate wildly. Real estate isn’t as bad as stocks, again because of price rigidity—houses rarely have their values re-assessed multiple times per year, let alone multiple times per second. But real estate markets are still unstable, because of so many people trying to speculate on them. We think of real estate as a good way to make money fast—and if you’re lucky, it can be. But in a rational and efficient market, real estate would be almost as boring as stock trading; your profits would be driven entirely by population growth (increasing the demand for land without changing the supply) and the value added in construction of buildings. In fact, the population growth effect should be sapped by a land tax, and then you should only make a profit if you actually build things. Simply owning land shouldn’t be a way of making money—and the reason for this should be obvious: You’re not actually doing anything. I don’t like patent rents very much, but at least inventing new technologies is actually beneficial for society. Owning land contributes absolutely nothing, and yet it has been one of the primary means of amassing wealth for centuries and continues to be today. But (so-called) investors and the banks and hedge funds they control have little reason to change their ways, as long as the system is set up so that they can keep profiting from the instability that they foster. Particularly when we let them keep the profits when things go well, but immediately rush to bail them out when things go badly, they have basically no incentive at all not to take maximum risk and seek maximum instability. We need a fundamentally different outlook on the proper role and structure of finance in our economy. Fortunately one is emerging, summarized in a slogan among economically-savvy liberals: Banking should be boring. (Elizabeth Warren has said this, as have Joseph Stiglitz and Paul Krugman.) And indeed it should, for all banks are supposed to be doing is lending money from people who have it and don’t need it to people who need it but don’t have it. They aren’t supposed to be making large profits of their own, because they aren’t the ones actually adding value to the economy. Indeed it was never quite clear to me why banks should be privatized in the first place, though I guess it makes more sense than, oh, say, prisons. Unfortunately, the majority opinion right now, at least among those who make policy, seems to be that banks don’t need to be restructured or even placed on a tighter leash; no, they need to be set free so they can work their magic again. Even otherwise reasonable, intelligent people quickly become unshakeable ideologues when it comes to the idea of raising taxes or tightening regulations. And as much as I’d like to think that it’s just a small but powerful minority of people who thinks this way, I know full well that a large proportion of Americans believe in these views and intentionally elect politicians who will act upon them. All the more reason to break from the crowd, don’t you think?